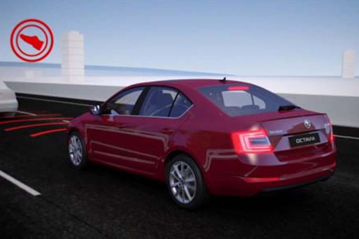 Skoda Front Assistant is a system designed to help avoid or to mitigate accidents into the rear of preceding traffic. A long-range radar, positioned at the front of the car, can detect vehicles up to 80m ahead which the car is likely to hit unless action is taken. The information from the front radar is optionally combined with data from a windscreen-mounted camera to calculate the likelihood of an impact. The system uses escalating measures at certain critical points to try to help the driver avoid an accident. Firstly, when the system calculates that a collision is likely, it issues an optical and an acoustic warning and pre-fills the braking system in preparation for an avoidance manoeuvre by the driver. If the driver does not react and the criticality increases a further warning is given: a small braking jolt serves as a ‘haptic’ warning, encouraging a driver reaction. At the same time, the brakes are prepared so that if the driver does brake, to whatever extent, Front Assistant plus will automatically apply the braking force needed to avoid or mitigate the collision. If there is still no reaction from the driver, the system autonomously applies braking to try to mitigate a collision. Up to 30km/h Front Assistant applies full braking, and can detect moving or stationary objects; between 30km/h and 80km/h, there is no automatic braking but the system will warn the driver if it detects a stationary object; in moving traffic, between 30km/h and 200km/h, the system applies its full capacity of driver warnings, partial braking and brake assistance. Analysis of accident databases reveals that some 19 percent of people injured in passenger cars are involved in longitudinal accidents. The main causes of such accidents are driver distraction or inattentiveness, and driver misperception where a driving situation is misjudged. Skoda Front Assistant operates, with different levels of functionality, at speeds between up to 200km/h. If all cars on the road were equipped with such a system, it is estimated that over 130 lives could be saved and more than 2000 serious injuries addressed each year. Skoda Front Assistant can be switched off by the driver. If it is switched off, this mode is stored on the ignition key used at that time and remains off for the user of that key until it is turned back on again. It does not default to ‘on’ at the beginning of a new journey. Skoda Front Assistant requires a sufficient radar reflectance of the objects which the car is approaching. Also, the radar sensor needs a clear ‘view’ of the road in front and its efficiency is compromised by contamination such as snow, heavy spray, ice or dirt. At speeds above 30km/h, the degree of partial braking provided by Front Assistant depends on whether an optional mono-camera is fitted or not. With the camera, partial braking of 6ms-2 is applied; without it, the deceleration provided is 3.5ms-2. The system has been tested for software testing. In a laboratory environment SiL (software in the loop) and HiL (hardware in the loop) tests were performed to validate system functionality. External organisations conducted work for Skoda to examine the influence of different warning strategies on driver reaction. Such work was complemented by extensive track testing to ensure that Skoda Front Assistant met targets for when warnings were given to the driver, and the points at which partial and full braking were applied. In addition, Skoda drivers covered several millions of kilometres of real-world driving to ensure system reliability and performance.